The teeth are greatly contributed to one’s facial beauty; hence everyone wants the teeth to be in best visible condition. But often the teeth may turn to be yellowish or greyish due to certain dental disease or lack of proper care. Multiple teeth may break due to accidents or absence of sufficient calcium in tooth enamel leading to an embarrassing appearance. Some people may have naturally oddly shaped or abnormally large sized teeth, which ruin the beauty of their smiles. The different applications of cosmetic dentistry are the best options for correcting all these dental problems, leading to an attractive smile. Whitens the teeth – As the discolouration of the teeth is a major problem faced by many people, the modern technique of whitening the teeth is the most popular segment of cosmetic dentistry. The expert dentist cleans up all the deposited debris along the teeth joints and removes all the unwanted stains caused due to the intake of tobacco products, too much coffee, black tea and some other foods or drinksthat stain the teeth. 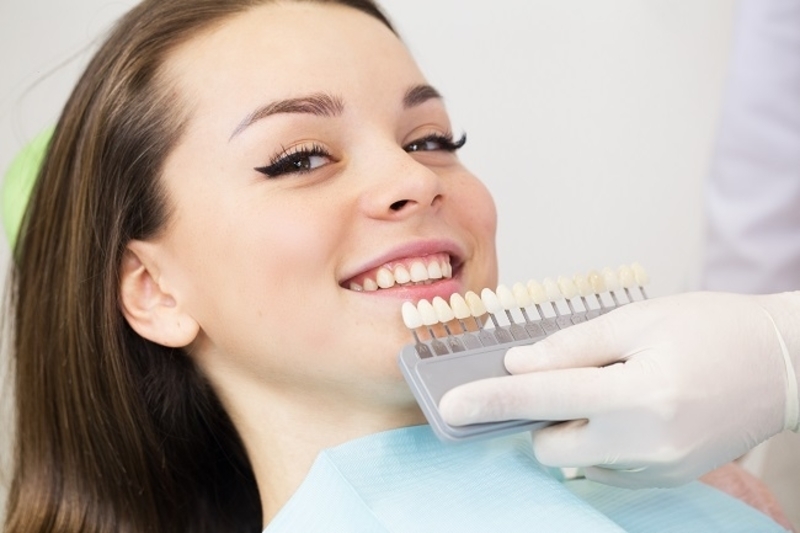 The application of mild bleaching also helps in restoring the original shine and whiteness of the teeth. Rectifies all kinds of defects – It is common for people to have too small teeth or too big sized or teeth that have an odd appearance. There can be visible cracks or large gaps between two teeth, which may look weird with smile. The latest cosmetic techniques help in correcting all these dental errors and even conceal the uneven gum lines and other visible in-born defects of the mouth. Makes the appearance younger – The dentists make their patients smile dazzling by applying different cosmetic dental techniques. Mainly the discolouration and the decaying of the teeth are the two major factors that make people look aged, which can be perfected by the expert cosmetic dentists. The elderly people may look younger with the finely designed false dentures that look as good as the natural teeth. Save tooth from decay in style – When cavities are formed within the teeth, the best way is to save the affected teeth is to fill up the cavities with composite fillings that match the natural colour of the teeth instead of the traditional dark coloured fillings. Moreover, the white filling material is more durable than the previous dark filling, as this white composition is harder and solidifies much faster than before. Protect teeth from all damages – The techniques of cosmetic dentistry are not all about making someone’s teeth look beautiful, but the application of crown or veneer over the natural teeth is to be used to protect those teeth from all kinds of possible damages. As these veneers and crowns are made of white porcelain of high longevity, the teeth look much better after the installation of these artificial caps or protectors. Moreover, these crowns and veneers effectively conceal the defective shapes of the teeth thus enhancing their beauty. Fill up missing gaps – Sometimes, gaps may be formed among the teeth due to broken teeth or tooth extraction, which should be filled up either with bridges or implants that look just the same as the surrounding natural teeth. If these gaps are not filled up immediately, the adjacent teeth may shift positions to some extent and form misaligned dental appearance. Makes a better career in glamour world – Many career options related to media and entertainment, like acting, modelling, anchoring and news reading need to have perfect facial features and confident smiles. The services provided by the cosmetic dentists can help people with flawless dentures, which boost their confidences for these jobs. Hence, now the cosmetic dental procedures are in great demand among the people suffering from any type of dental problem.